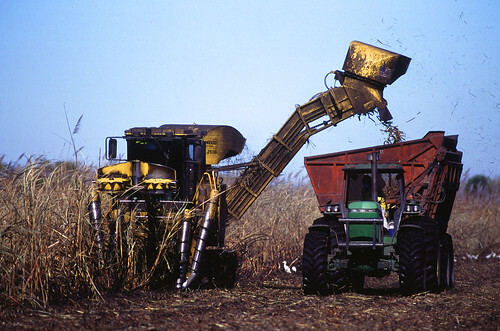 Harvesting sugarcane in south Florida, ARS scientists at the Sugarcane Production Research Unit are identifying research to help sustain both agriculture and natural Everglades ecosystems. Most of us accept that some services—such as waste water treatment and emergency response, for example—have an economic value. As citizens, we decide to support these services for our safety, security and comfort. And yet there are many other functions going on every day, all around the world, that are not directly supported but still enable our planet to maintain favorable living conditions for all living creatures—functions like bees pollinating our crops, forests absorbing excess carbon dioxide, or dung beetles breaking down animal wastes. These functions, known as ecosystem services, include all the jobs performed by the components of an ecosystem, coming from biotic components like plants and insects, to abiotic components, such as the soil and wind. Ecosystem services include things like pollination (approximately one third of the human diet comes from insect pollinated plants), water filtration (wetlands protect water quality by trapping sediments and retaining pollutants such as heavy metals), energy (7 percent of US power comes from hydroelectric plants), and tourism (nature-based tourism or ecotourism is predicted to grow to 25 percent of the world travel market by 2012). And these services, without most of us even knowing it, add substantially to our economy. For example, the value of insect pollination has been estimated at up to $15 billion in the United States annually, and ecotourism has a worldwide value of approximately $473 billion per year. As a growing world population slowly pushes ecosystem services to new limits, the issue that more and more scientists and policymakers are trying to confront is how to value ecosystem services. Because we don’t directly support many of these services, we may undervalue them. Yet ecosystem services are very valuable to agriculture, which is why USDA scientists and policy makers are increasingly working to understand ecosystem services and find ways to elevate our understanding of their importance and value them at the same time. Many USDA agencies have active research programs in the area of ecosystem services. For example, ERS is investigating the economics of ecosystem services and design issues for ecosystem service markets, including the use of greenhouse gas offsets and interactions with conservation programs. NIFA has several programs that address environmental markets, including a program on enhancing ecosystem services from agricultural lands and the National Integrated Water Quality Program, whose goal is to contribute to the improvement of the quality of our nation’s surface water and groundwater resources through research, education, and extension activities. And ARS has a Water Availability & Watershed Management National Program which addresses the highest priorities for agricultural water management including erosion, sedimentation, and water quality protection, and improving watershed management and ecosystem services in agricultural landscapes. Agriculture plays a major role in protecting ecosystem services, and in turn can reap great benefits from services that are functioning properly. Given that, it’s encouraging to know that USDA scientists and policy makers will continue to do their part to ensure that America’s ecosystems are able to provide the services we all need long into the future. ScienceDaily (Dec. 21, 2009) — Human activity is increasing the supply of nutrients, such as nitrogen and phosphorus, to stream systems all over the world. The conventional wisdom -- bolstered by earlier research -- has held that these additional nutrients cause an increase in production all along the food chain, from the tiniest organisms up to the largest predators. A long-term, ecosystem-scale study by a team of University of Georgia researchers, however, has thrown this assumption into question. The researchers -- a team from the UGA Odum School of Ecology and department of entomology in the College of Agricultural and Environmental Sciences -- found, unexpectedly, that while nutrient enrichment did indeed cause a steady increase in the production of organisms lower on the food chain, organisms at the top of the food chain did not benefit. Their study, published in Proceedings of the National Academy of Sciences, was funded by the National Science Foundation. It documents the effects of long-term nutrient enrichment of a headwater stream in a forested area at the Coweeta Hydrologic Laboratory in North Carolina. For the first two years of the study, the results were as expected: the production of both prey (the organisms low on the food chain) and predators (in this case salamanders and macroinvertebrates) increased. But with continued addition of nutrients, things began to change. While the prey continued to increase at the same rate, the production of predators leveled off, signifying a 'decoupling' of the typical relationship between predators and prey. Maintaining patterns of energy flow between predators and prey is a critical aspect of healthy ecosystems. "What we found was a dead end in the food chain," said Amy Rosemond, assistant professor at the Odum School, and one of the lead researchers. "This is the first time we've seen this kind of trophic decoupling, or break in the food chain, between the levels of prey and predator on this scale. This kind of disruption of the food web wasn't on anyone's radar screen before now. " In this instance, Rosemond explained, the break was driven by the traits of the various prey species that inhabit the stream system. Some of these species were better able to take advantage of the extra nutrition than were others. After the first two years, the nutrient enrichment began to favor the growth of large-bodied prey, such as the caddisfly, Pycnopsyche spp., over smaller organisms. These large-bodied prey were simply too big for the stream's predators to consume; hence, they were unable to capitalize on the increase in available food. John Davis, who conducted the research as part of his Ph. D. dissertation, said that the work has global implications. "Nutrient enrichment is a global threat to the health of freshwater ecosystems," he explained. "However, our understanding of its effects is limited. Our experimental results varied substantially from the few other large-scale experiments, which suggests that ecosystem-level responses to nutrient enrichment are largely context-dependent. This is important because humans are increasing nutrient loading rates to a diversity of ecosystems, but our understanding of their effects is based on only a small number of ecosystem types. " Rosemond said that their results point to the need for more research, especially large-scale, long-term studies in a variety of ecosystems. Davis agrees. "It took over four years for nutrient enrichment to decouple predator and prey production within these headwater streams," he said. "But most ecological experiments are limited to time scales of weeks to months. " And the need to understand the effects of nutrient enrichment continues to grow more important. According the Environmental Protection Agency, the health of 47 percent of lakes and 45 percent of streams in the U. S. is impaired, with excessive nutrients a significant source of that impairment. Nutrient inputs to lakes and streams are likely to continue to increase globally from fertilized agricultural and suburban lands and from human and animal wastes that enter aquatic systems from treated sewage, septic tanks, or run-off from land. Furthermore, headwater streams, like the study stream in Coweeta, may account for as much as 73% of all stream miles. These headwater streams are the 'feeders' of larger rivers, so their response to nutrient enrichment likely affects downstream systems as well. But long-term effects of nutrients have not been previously tested in these systems. "Without more accurately assessing the long-term effects of nutrients on a diversity of ecosystem types," Davis concluded, "we won't be able to adequately predict how global ecosystems are going to respond to chronic nutrient enrichment. "